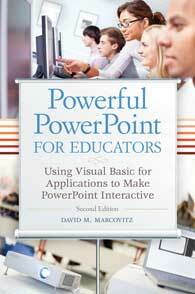 This is the companion Web site to the book, Powerful PowerPoint for Educators: Using Visual Basic for Application to Make PowerPoint Interactive by David M. Marcovitz. This site contains examples from the text and examples from other contributors. If you do not own the book, click on the Buy the Book button on the left to find out how you can get it. This second edition has many updates and additions to the first edition. The biggest changes are to reflect the changes in PowerPoint since PowerPoint 2003 for Windows and PowerPoint 2001 for Macintosh. All examples should work with earlier versions but reflect new features (and bugs) of the most recent versions: PowerPoint 2007 and 2010 for Windows and PowerPoint 2011 for Macintosh. Some of the material has been reworked based on feedback from readers and students over the years and two news chapters have been added. Chapter 3 goes into more detail about many of the traditional interactive multimedia features of PowerPoint and Chapter 11 adds advanced tricks reflecting the many requests I have had over the years for ways to have PowerPoint communicate beyond itself, such as writing to text files and Excel files. create rudimentary multiple-choice tests (clicking on a button with the correct answer takes the student to a slide that says "correct," for example). Standard III.A.7-Use methods for teaching concepts and skills that support use of web-based and non web-based authoring tools in a school environment. Standard III.C.1-Use methods and facilitate strategies for teaching problem solving principles and skills using technology resources. Standard V.C.7-Use examples of emerging programming, authoring or problem solving environments that support personal and professional development. Additionally, in the 2011 standards that were in the process of being released at the time of writing this book, several of the standards begin with the phrase that "Technology coaches coach teachers in and model design and implementation of technology-enhanced learning experiences É" in order to achieve a wide range of educational aims (International Society for Technology in Education, 2011). While this does not refer specifically or exclusively to creating interactive multimedia, interactive multimedia can be an important part of technology-enhanced learning experiences. Scripting might not be a useful technique when used with a stand-alone programming language, but the real power of using VBA with PowerPoint is not merely that VBA is an accessible scripting language but that it is built into PowerPoint. One of my students created a presentation about Hawaii. It included pictures, videos, recorded voices, and links to Web sites. All of this used traditional PowerPoint technology (no scripting required). On top of that, she added an interactive menu and a quiz with feedback about how well the user did on the quiz. Building all of this from scratch with a programming or authoring tool could be an overwhelming task, but 95 percent of the presentation was done with traditional PowerPoint tools (things most teachers already know how to do or can learn within a couple of hours). When a few scripts are added on top of the traditional PowerPoint tools, the results are rich not only with media but also with interactivity. Remember, the more you know, the more you can do. With a few scripts, you can add short-answer questions (with feedback about right and wrong answers) and keep score. Add a few more scripts and you can have a menu that keeps track of which sections of your presentation have been visited and only shows the button to take the quiz when all sections have been visited. Add a few more scripts and you can have the user type things that change the slides in the presentation. The possibilities are endless. The more you know, the more you can do. And you can always add more traditional PowerPoint without knowing any more VBA. I have been using this material (before writing a book about it) with my students, who are mostly teachers, enrolled in a graduate course in multimedia design for the classroom, for about ten years. They have created powerful projects for their students (like the Hawaii project mentioned earlier). In addition, I have been speaking about this at conferences and workshops. The overwhelming reaction I get is, "That's great! I didn't know you could do that." While this book is not accessible for computer novices, teachers who are beyond the level of computer beginner can use this technology to create powerful material for their students, material that goes beyond a simple page-turner. For the professional multimedia designer, PowerPoint might not be the right choice. However, expensive and complicated tools are not common in schools. Using PowerPoint as a framework, teachers are able to add as much or as little interactivity as their skills allow and their needs require. Thus, PowerPoint is an appropriate multimedia tool for teachers and a powerful addition to a multimedia design class. This book can be used as a stand-alone book in a multimedia design class for educators or as a companion for books like Ivers and Barron (2010) or Agnew, Kellerman, and Meyer (1996), which focus on multimedia design and using multimedia projects in classrooms but do not deal with a specific technology for implementing the projects. It also stands by itself without a class. Anyone with basic PowerPoint skills can sit down with this book and begin to create powerful educational material for themselves, their colleagues, their students, or their own children. Chapter 1 begins the book with some important principles of instructional design, including how to design your own projects and create assignments for your students to design their projects. If this book is used in conjunction with a book about design, the first chapter will provide an overview of what you will find in the design books, but if this book is used by itself, this chapter is very important. Jumping in and creating things is fine when you are playing around, but serious projects require some planning and design work, and Chapter 1 will give you a foundation in that. Chapter 2 helps you configure PowerPoint by adjusting the settings needed to use the techniques in this book as well as other settings that are helpful. It also gives you an overview of the different file types that PowerPoint can create as well as the major differences among the different versions of PowerPoint. Chapter 3 begins to explore some of the traditional interactive multimedia features of PowerPoint. Adding pictures, sounds, buttons, and hyperlinks is not difficult, but many PowerPoint users have never used those features before. Chapter 4 introduces VBA. YouÕll understand how VBA fits into the world of object-oriented programming and how that affects you as a scripter. As a scripter, you wonÕt have to understand all of VBA and object-oriented programming, but understanding objects and how to manipulate them will help you understand your scripts. Chapter 5 begins the heart of the book as you start to learn about scripting with VBA. YouÕll learn how VBA is connected to PowerPoint and how to write and run your first script. YouÕll also learn about keeping your scripts private so your students canÕt look for the answers in your scripts. Chapters 6 and 7 build your bag of scripting tricks. As a scripter, you will be interested in taking scripts directly from these chapters and applying them to your own purposes. While each chapter contains examples that you can use right away, Chapter 8 focuses on examples that you will be able to use to create quizzes and tests. Once you have completed Chapter 8, you will have a large bag of tricks that you can use by copying scripts directly from the book and possibly creating some on your own. Chapter 9 describes more tricks that you can use, particularly if you are ready to modify some of the ideas in the book for your own purposes. It ends with a powerful example that I used with my daughters as they were learning to read. This was around the time I was writing the first edition; now they are in high school and middle school. Chapter 10 is a completely new chapter for the second edition with some advanced tricks. It contains ways for PowerPoint to communicate within itself and with other types of files. It focuses on using tags to store information within a PowerPoint file, writing and reading information to and from a text file, and writing information to an Excel file. Once you have mastered a large bag of tricks, you might need some help correcting your mistakes. Whenever you write scripts, even if you just copy them from the book, you are likely to make a few mistakes. Fixing mistakes is called debugging, and you will learn some of the secrets of debugging in Chapter 11. Note that Chapter 11 is a good chapter to refer to before getting through all the previous chapters. You might want to start glancing over at Chapter 11 as you begin Chapter 7 and continue referring back to it as you finish the rest of the book. By the time you finish Chapter 11, you will be excited to create things yourself, but you might want to share your knowledge with your colleagues and your students. Some of them will share your enthusiasm and borrow your copy of this book (or better yet, buy their own copy) and dive right into powerful PowerPoint. Others wonÕt be ready for the technical challenge. Chapter 12 describes how you can use templates, so your colleagues and students can take full advantage of the power of VBA scripting without knowing any of it. You can use what you learn in Chapter 12 to provide a template for your colleagues or students with the scripting already done for them (by you). When you have completed the book, you might not be an expert at using VBA to create powerful interactive multimedia projects, but you will have a large bag of tricks that can help you do more with technology to make you a better educator. This page was created by Dr. David M. Marcovitz.